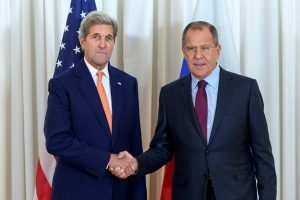 GENEVA — U.S. Secretary of State John Kerry says he and Russian Foreign Minister Sergey Lavrov “have achieved clarity” on a path to restore a truce in Syria but details remain to be worked out. After meeting off-and-on with Lavrov for nearly 10 hours in Geneva on Friday, Kerry said the “vast majority” of technical discussions on steps to reinstate a ceasefire and improve humanitarian access have been completed. Kerry says experts will remain in Geneva with an eye toward finalizing the unresolved steps in the coming days. Lavrov echoed that, saying “we still need to finalize a few issues” and pointed to the need to separate fighters from the al-Nusra Front, which has ties to al-Qaida, from U.S.-backed fighters who hold parts of northwest Syria. Lavrov insisted that a resumption of U.N.-mediated talks between the Syrian government and the U.S.-backed opposition that were suspended in April should help reduce hostilities that have flared in recent months. He also hailed an improved atmosphere between Moscow and Washington. Friday’s meeting came a month after the two men met in Moscow and agreed on a number of unspecified actions to get the all-but-ignored truce back in force. However, as in Moscow, neither Kerry nor Lavrov would describe them in detail. And, underscoring deep differences over developments on the ground, Kerry noted that Russia disputes the U.S. “narrative” of recent attacks on heavily populated areas being conducted by Syrian forces, Russia itself and the Iranian-backed Hezbollah militia. Russia maintains the attacks it has been involved in have targeted legitimate terrorist targets, while the U.S. says they have hit moderate opposition forces. Expectations had been low for the talks, particularly given how efforts to forge a new U.S.-Russia understanding have fallen short virtually every month for the past five years. At the same time, the Obama administration is not of one mind regarding the Russians. The Pentagon has publicly complained about getting drawn into greater cooperation with Russia even though it has been forced recently to expand communication with Moscow. Last week, the U.S. had to call for Russian help when Syrian warplanes struck an area not far from where U.S. troops were operating. U.S. officials say it is imperative that Russia use its influence with Syrian President Bashar Assad to halt all attacks on moderate opposition forces, open humanitarian aid corridors, and concentrate any offensive action on the Islamic State group and other extremists not covered by what has become a largely ignored truce. For their part, U.S. officials say they are willing to press rebels groups they support harder on separating themselves from the Islamic State and al-Nusra, which despite a recent name change is still viewed as al-Qaida’s affiliate in Syria. Referring to Daraya, Lavrov said: “This is an example I think will get some following.” He said the Russian military’s reconciliation center in Syria has received a request from another area to organize a similar operation — with Russian mediation. Associated Press correspondents Matthew Lee and Jamey Keaten wrote this report.